Ausiello: Jen returns with big news that may or may not involve a valuable (and iconic) piece of real estate. Ausiello: The promo for next week’s episode gives away pretty much everything… except the big twist. Ausiello: Something really bad and potentially irreparable. Ausiello: I have a very strong hunch The CW will give the show a 13-episode pickup, although we’ll probably have to wait until May for an official announcement. Don’t know too much about the finale, except that it ends with an outta-nowhere cliffhanger. Ausiello: If the ratings hold steady, I think we’re looking at a 13-episode thingamajig here as well. On the scoop front, Baze finally confesses his feelings for Cate in next Monday’s road trip-themed episode. Unfortunately, the person he comes clean to is Lux. Just remember the so-called “indecent proposal” storyline was done on Beverly Hills 90210 in season 6, with Valerie, David and Ginger. I also mentioned this in February when Ausiello first hinted this storyline was coming up. This is the clearest sign we’ve gotten yet about One Tree Hill–but don’t pop the champagne bottles yet (or bash in your TV, whatever your opinion). Tonight I had the opportunity to watch the first three episodes of Life Unexpected, courtesy of the The CW, which sent me an advanced copy. The show centers around 15-year-old Lux (which is why the show was formerly known as Life UneXpected), a young girl who is seeking emancipation after spending her life being bounced around foster homes. Since she was never adopted, she needs the signature of her birth parents and sets out to find them. She does (in seemingly record time, mind you) and both are understandably shocked. All three are then thrown for a loop when the judge, instead of granting emancipation, makes Lux’s parents temporary co-guardians. For months critics have been raving about the show, saying it is reminsicent of The WB, where substance and heart were favored over style and shock. Life Unexpected has the wit of Gilmore Girls and the emotional complexity of Everwood. Less than 20 minutes into the first episode, tears were already welling up in my eyes. I was moved several times, in fact, but also giggled and chuckled a ton, too. That’s not to say there aren’t any cliches or weak points but as we know from watching the teen dramas, those are to be expected. It’s not surprising executive producer/writer Liz Tigelaar started out working for Dawson’s Creek and it seems she learned well. Shiri Appleby (Rene, Beverly Hills 90210) stars as Lux’s mother, who is in a romantic relationship with her radio show co-host, played by Kerr Smith (Jack, Dawson’s Creek). It was hard at first to see Appleby as a mom but perhaps that is the point: her character Cate is only 32 years old, making her a teenager when she got pregnant with Lux. Smith, who has thankfully dyed the grey out of his hair, is definitely in a supporting role, one whose future on the show I question despite the press materials. He’s included as if he’s here for the long-haul but it seems to me that Cate and her babydaddy Nate, played by Kristoffer Polaha, are destined for each other in the end. It’s also worth noting that this will be the third show on The CW right now with a main character called Nate. Lux reminded me of One Tree Hill’s Sam (Ashley Rickards), the foster child Brooke (Sophia Bush) takes in in season 6. The two characters may not look alike but their personalities are strikingly similar. Cate has shades of Brooke as well and at times the plot felt very familiar. But that doesn’t mean it wasn’t worth watching. The three episodes held my attention throughout and I’m eager to see what other angles of this story–which easily could’ve been depicted entirely in a 2-hour movie–are explored throughout the season. 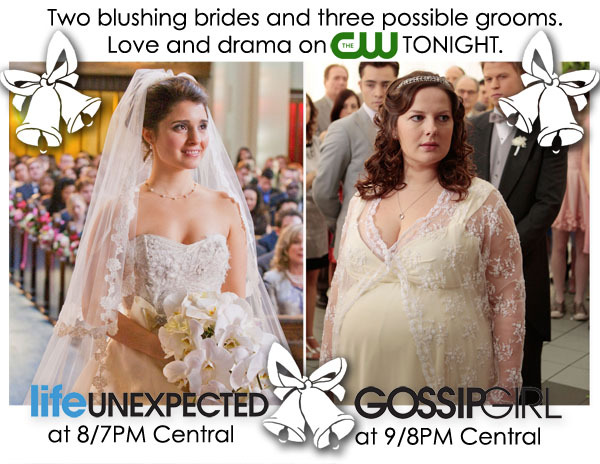 I highly encourage you to tune in on January 18, when Life Unexpected premieres after the new episode of One Tree Hill. I’m honestly worried about the ratings the show will get both that night and in the weeks to come since, as I mentioned above, this show sooooo isn’t a CW show. While I personally think that’s a good thing, other viewers may not. Here’s hoping there’s enough people out there clamoring for the days and ways of the WB. I have to note, though, that Life Unexpected won’t be covered extensively on this site since it is not a teen drama. I will continue to include it as I have thus far: when there’s something relevant to Smith or Appleby or some other teen drama connection. But, again, I really hope you’ll watch it.